Do you know the book, All I Really Need to Know I Learned in Kindergarten? It’s a marvelous book written by a Seattle-area author. I wish I could write the same book about coaching school, All I Really Need to Know About Coaching I Learned in Coaching School. However, after 10 plus years of coaching, I’m realizing how much I didn’t learn about coaching in either of the two certified coaching programs I completed. While I really could write a whole book about what I didn’t learn about coaching in school, I’m focusing this article on four key insights I’ve gained only from thousands of coaching hours, much of which has felt like trial and error. I’m hoping these four key concepts that coaching schools don’t emphasize will help make your learning curve steeper than mine was! Sure, pretty much every coaching school provides direction on contracting. After all, ICF Core Competency #2 is Establishing the Coaching Agreement. It relates to determining the client’s desired outcome, both for the coaching relationship as a whole and for each coaching session. What they don’t teach you is how difficult and sometimes slippery it can be to actually obtain that contract. Clients frequently show up for a session with a turbulent mix of emotions, about a myriad of topics. Some are related to the coaching work and some are not. They want to dive into the safe space you’ve created, spill it out, and basically, get whatever’s going on off their chest. Because you are caring, warm and empathetic, you connect with them and share in their feelings. And if you’re not intentional, you can get caught up in the client’s emotional tide and come to the end of the session without having forwarded the client’s agenda. How do you establish a contract with an emotional client? First, acknowledge the emotion. Then determine if it’s something they would like to clear or if it’s something they’d like coaching on. If it’s something they would like to clear and not be the focus of the coaching, you can ask a question like “What would you like to say or do to clear this and be present for the coaching?” Usually, the client just wants to vent a bit more and after, is ready to move on. Then you can begin to establish the contract for the session. You can begin to create the contract with a question like, “What would you like to focus on today?” or “What would you like to accomplish for our time together today?” Be prepared to ask this question two or even three times. 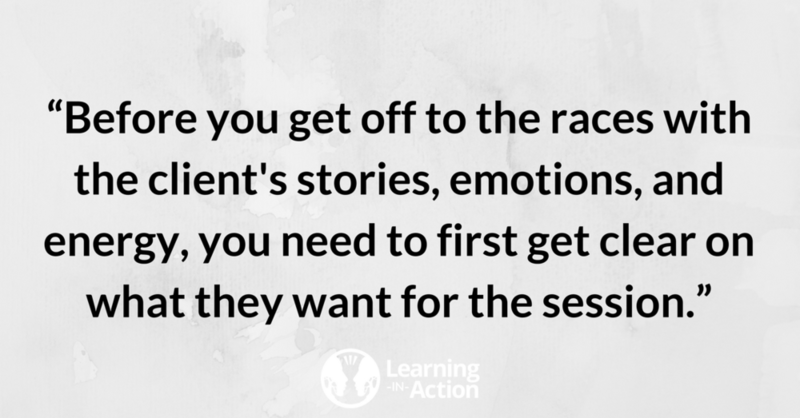 Emotional clients can launch into one story after another, without actually naming their focus or what they want. And sometimes you’re helping them to sort through their emotions enough to name what they want coaching on is the highest value they receive from the session. Score! Once you know what the client wants to focus on, the contract still is not complete. From there, you’ll want to complete the contracting process by anchoring it with 1) what makes the topic important to the client, 2) the outcome they want for the session and 3) how they would measure that outcome. Ideally, you want the client to recap all of that so they know and own what they want to have come out of the session. Once you have all of that, then and only then, do you have a clear contract for a session. When a client shows up in an emotional or otherwise distracted state, they often don’t know what they want from the session. It’s the coach’s job to help the client get clear about what they want and secure the contract for the session. The contract is an essential element to moving the client forward toward their overall desired outcome. If there is no contract, there is no coaching. Definitionally. A session without a contract isn’t coaching. Coaching schools are great at teaching principles, frameworks, and competencies. And principles, frameworks, and competencies are set pieces while the act of coaching is fluid and dynamic. While coaching schools do everything they can to help you to develop your craft by providing you opportunities to coach, they leave it to you to learn your own way of navigating each coaching session from the contract at the beginning to the desired outcome, hopefully, at the end. Many new coaches get into the middle of a coaching session and get stuck, unsure what question will lead the client to their desired outcome. Even coaches with many hours experience will get to the end of the session having coached their client to a different outcome than the one they ask for. Coaches with years of experience develop an intuitive sense for divining a dynamic path of questions that will lead to the client’s desire outcome. I call this the Coaching Path. The Coaching Path is a sequence of the fewest, most robust questions that lead to the fulfillment of the client’s desired outcome. Any experienced coach will tell you, there is no one right path and no one right set of questions. (One of the joys of coaching is its creativity and the freedom to use intuition.) And one can learn the guideposts for navigating a viable Coaching Path without the trial and error of hundreds of hours of coaching. The key concept here is that the Coaching Path does exist in every session with every client. We just have to know how to find it. Coaches with many years experience often develop an unconscious competence in divining the Coaching Path. They masterfully intuit the question, request, acknowledgment, reflection that guides the client to their desired outcome. Coaches do this by inhabiting three states of being: 1) Being wholly present with the client, in the moment, attuned with their feelings, thoughts, and desires, hearing what is unsaid, seeing what lies beneath the surface, feeling the unexpressed emotion. (BTW, every human is designed to be able to do this. It’s a muscle.) 2) Being present with their own feelings, thoughts, desires and intuition (not because the coach is driving the agenda, but because the coach’s experience of the client contains information for the client) and 3) Being a detached observer of the coaching process, present to the moment, the desired outcome and the arc of the coaching session, planning the path of questions that lead to the client’s desired outcome. And constantly checking in with their sense of the client’s deep desire, comparing it to what they said they wanted and re-contracting as needed. You might be thinking, “Yeah, right! And then I’d teleport to my next coaching session.” Yes, this is the long way. It requires time in the coaching saddle. And there’s a short cut. “The client has the answers” – we hear this all of the time in coaching, including in coaching school. What we don’t hear as often is the corollary which is “The client is constantly giving the coach clues to help them find the answers they seek.” The client provides the coach with clues or guideposts that tell the coach where they want to go. The guideposts to the Coaching Path come in the form of energy and information. The single, most reliable guidepost of the Coaching Path is the client’s energy. If the coach does nothing more than tune into the energy of the client, track it, attune with it, and ask about it, many times, the Coaching Path reveals itself. Clients reveal their energy 1) in the tone, volume, and pace of their words 2) in their body language and facial expressions 3) in the words they use. (You know that). Example: Client: (words pour out, eyes are wide, a slight smile on the face) “I can’t believe my friend just quit. I had no idea. It came out of nowhere.” Coach: “And you seem excited about it!” Client: “I am. I want his job and now it’s open. But I’m struggling with how to talk with my boss about it so soon.” Coach: “What’s the struggle about?” The key to divining the Coaching Path is staying with, reflecting and inquiring about the client’s energy and emotion, without making assumptions of where you think it is going or should go. The client leads the way with their energy and information. Everything the client says, does, writes, thinks, feels, is information for the coach. Whether it’s in what they say and how they say it about their weekend before the coaching session starts, or if it’s in the coffee they order and how they order it. (Yes, I do a lot of coaching in coffee shops. Sacrilege, I know!). Every client is consciously and/or non-consciously seeking answers to their own questions, constantly working on them in the background of their own experience. The coach’s job is helping the client to connect the dots of their experience, using all the information the client provides. For example, I had a client who said she was running a bit late for our session as her routine eye exam ran long. My question to her, “What is it you’d like to see more clearly.” That question allowed her to connect with her desire for clarity, creating an opening to a breakthrough. The client reveals the Coaching Path with their energy and information. Track the energy and information signposts and you’ll divine the Coaching Path toward the client’s desired outcome. Coaching school doesn’t teach you how you can unconsciously direct the coaching in a way that may be comfortable for you, yet doesn’t serve your client. Coaching school curriculum involves training that helps you to understand yourself better. It also prepares you for the actual experience of coaching itself. 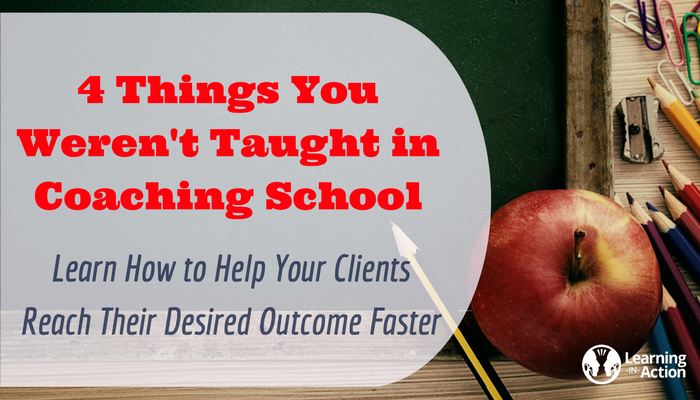 This serves to help you to better understand both yourself and your clients. However, that level of training doesn’t delve quite deep enough. 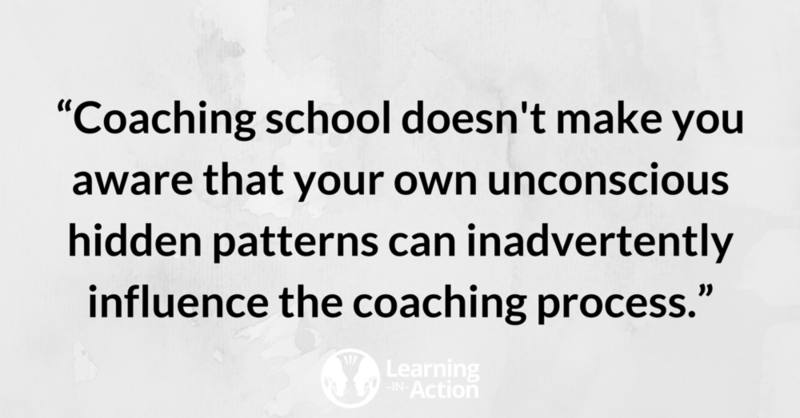 It doesn’t make you aware how your unique hidden patterns can inadvertently influence the coaching process. And if you’re not hyper-aware of your own patterns, they can dramatically affect your coaching as well as your client’s outcome. My hidden patterns were recently revealed to me by the EQ Profile. My EQ profile report told me something that I intuitively knew, but didn’t have conscious awareness of. When I’m stressed, what makes me feel better is to have a plan. For me, a plan is like salve on a wound. It makes everything better. However, I realize that’s not true for everyone. The EQ Profile made me aware that I tend to diverge from the Coaching Path and non-consciously coach my clients under stress toward creating a plan. I suppose my unconscious reasoning went something like “If a plan makes me feel better, it’ll make my client feel better too.” And frankly, that’s just bad coaching. And I had no idea I was doing it before my EQ Profile report revealed it to me. Now I can notice my tendency and stay attuned to the energy and information provided by the client and continue to follow the Coaching Path toward the client’s desired outcome. You will find that there are many concepts that aren’t taught in coaching school. Here I point out those that can impact you and your clients the most. Hopefully, these concepts will be like a coaching “hack” for you, allowing you to enrich your coaching without requiring hundreds of hours of experience to do it! Are you aware of your unconscious hidden patterns? Do you know how they could be affecting your coaching? If you’d like to learn how to uncover them, you can learn more about them at Learninginaction.com.